Thinking Of Replacing A Roof? When buying or selling a home, one of the big questions asked is the age of the home’s roof. This is a major component of the house and also one of the most expensive items to replace. The majority of homeowners do not have much experience with getting a new roof since they are built to last an average of 20 years. However, living in the state of Texas, we see our fair share of hail storms and many roofs here are replaced more frequently than once every two decades. Here’s some advice on how to determine if you need a new roof and how to go about getting one installed. 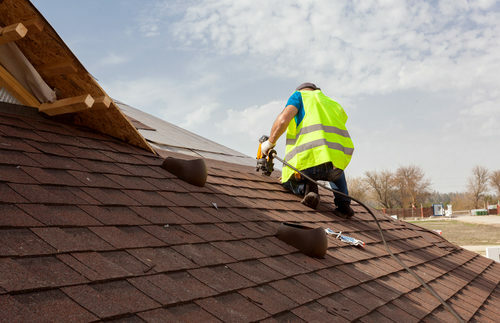 If you believe you may need a new roof – if there’s obvious damage, like a fallen tree or a leak – the first thing to do is have a roofing company do an inspection and give you an estimate. Many leaks can be repaired by replacing only a portion of the roof. However, if there has been a major hail storm then the odds are that the entire roof will need replacing. When finding a roofing contractor, be sure to ask for referrals from friends and neighbors or use a service like Angie’s List to find a reputable one. Get at least two estimates as well. If you plan to file a claim with your insurance company, they will likely have a list of preferred contractors for you. Your insurance company will also send an inspector out to view the damage and determine if they will pay all or a portion of your claim based on your policy’s coverages and limits. • Don’t make a substantial down payment. There are scams out there where companies will take that initial check from you and never return. Only make a payment after the work has begun or at least after the materials have been delivered. • Observe the roof contractor while he is performing the initial inspection. Watch out for the scammer who pulls up shingles or hits them with a hammer to mimic storm damage, or shows you pictures of roof damage from another house. • Watch out for storm chasers. Use a local roofing company that has been in business for many years. Some out-of-state companies do not have proper insurance coverage or licenses valid in Texas. They are also notorious for shoddy workmanship and using low-quality materials. Then, in a few years when problems with the roof arise, they have “disappeared” and are unavailable to fix any issues. Expect the roof replacement process to take about two weeks (weather permitting) and to be very noisy! Be sure you can reach out to the roofer after the first rain so they can check for leaks – even if you don’t see any, it is important to have this inspection done by a professional. Good roofers will clean up after themselves using industrial magnets to gather nails and debris, but you should also walk around your home’s perimeter to check for anything dangerous left behind.